Thanks for your interest in our Dodge Customer Car Showcase! 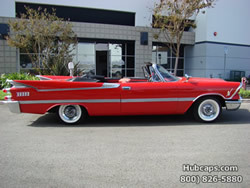 In over 30 years of business, we have amassed quite a few good stories about our customers and their classic vehicles. Although we do carry newer model hubcaps, we also do the best restoration work in the business for those of you who own vintage automobiles! Our customers are always shocked to see how wheel covers that are 20, 30, 40 or even 50 years old looking this good again! Dodge has been around since 1900 and building full automobiles (not just the parts) since 1915. Although the company has passed from owner to owner over the years, this marque has a special spot in the heart of every car guy and it has long since earned its place on the open road. Check out some of our customer’s classic cars and their newly refurbished hub caps by clicking on the links below! Don't miss out on a truly rare and special automobile! More information about this 1959 Dodge Lancer Custom Royal is just a click away, along with plenty of pictures and a quick video! Click here to learn more!